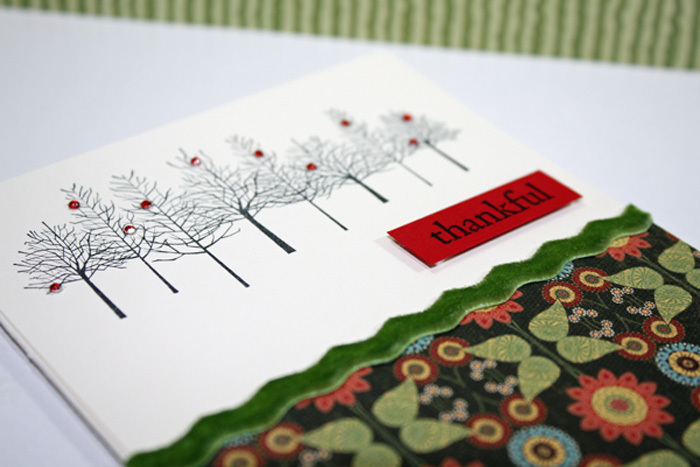 I was inspired by this tree stamp image from Memory Box when I saw it the other day at my local rubber stamp store. Being there reminded me so much of why I so enjoy shopping at Mom & Pop stores rather than the big box stores....there is inspiration everywhere. I found several new things. Here's the close up of a card I made this morning using my new rubber stamp along with the "thankful" sentiment from PTI's "Rustic Branches" set. Isn't this patterned paper so pretty? It's from a company called "graphic 45" which was also new to me. And the itty bitty gems are also from Memory Box. I think they will be perfect for mailing - not too much bulk going on. See you later.....have a Happy Thanksgiving!